Welcome to the release of this month. This is a post release update of major build v2.6. In this release which we have made several updates and fixes on last version. Highlights mentioned below. We already have URL based filtering support as explained in this link. Removed action icons for xs devices and added fullscreen support that gives native app experience. 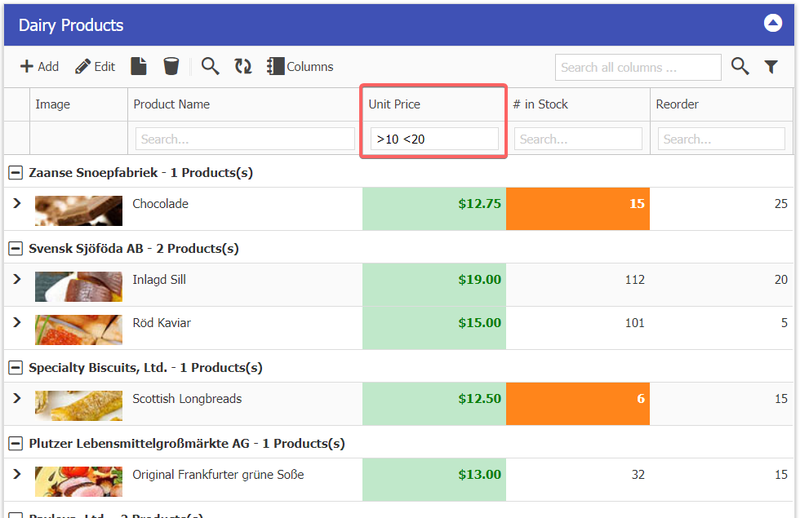 We’re working on couple of demo apps and most wanted pivot table feature which we plan to release in next build. Active License Subscription customers can get free upgrade using this link. Welcome to the release of PHP Grid Framework v2.6. There are a number of significant updates in this version that we hope you will like, some of the key highlights mentioned below. 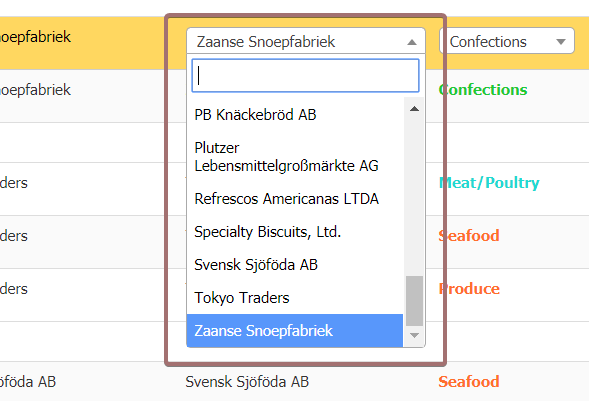 Enhanced Excel Style navigation, just like Google Sheets & MS Excel with no saving delay. Added Tooltips where required. Added ellipses (…) for long content. 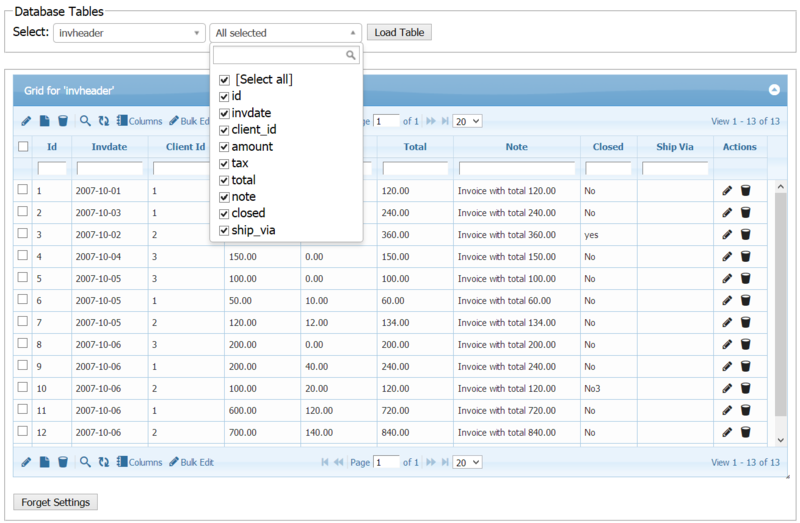 and it will result following searchable lookup dropdown. And finally, great experience on modern browsers. Around 200 fixes and updates. Last but certainly not least, a big Thank You! to our customers who helped to make our product even better. 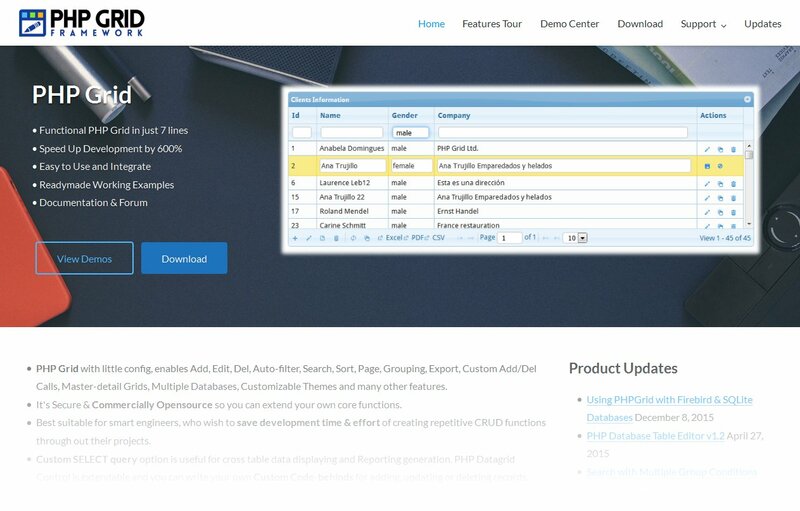 On various occasions, we want instant access to see or edit our database tables without having time to write a whole module with add, edit, delete, list, search (CRUD) operations. 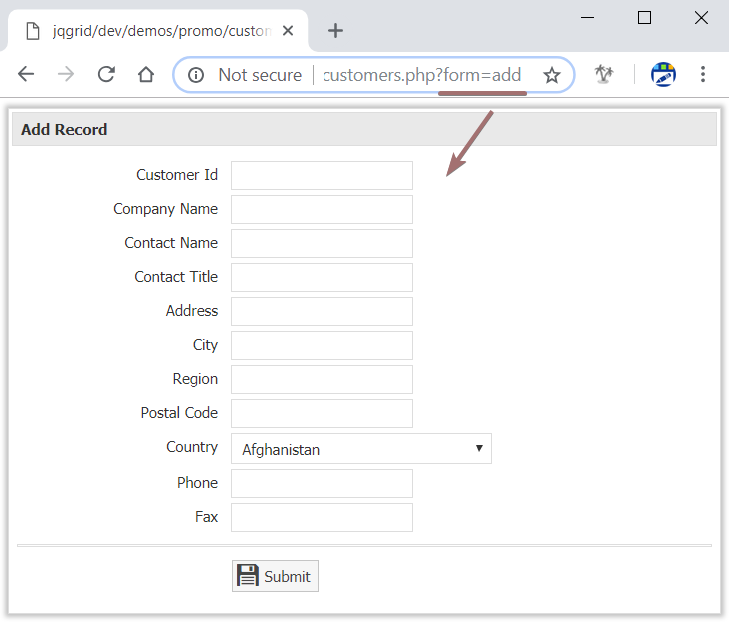 Whether your database is SQL Server, Oracle, DB2, MySQL or PGSQL — PHP Grid provides you easy solution that takes database credentials in config and provide table access in form of lightweight and rich featured PHP Grid. It will provide you complete functions within your existing application admin interface. 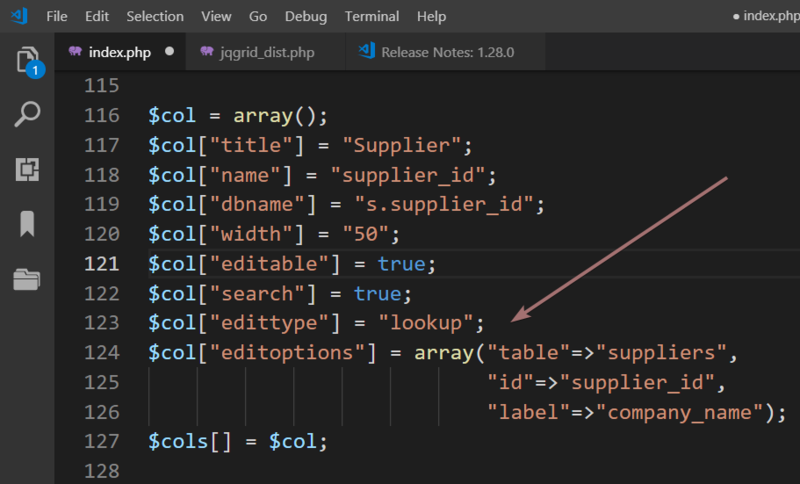 This lightweight, yet power-featured PHP Grid Database Editor is developed by very simple code OR we can say by just configuration. In main code logic, we simply passed the dropdown value of selected table in $g->table attribute, and that’s all! You can extend this code to incorporate Access Control (ACL), Exporting Data (PDF, CSV, XLS) and several other features to make a powerful tool. We omitted them to show the code simplicity. This demo is based on MySQL, but you can have same function for MS SQL Server, Oracle, PgSQL databases. 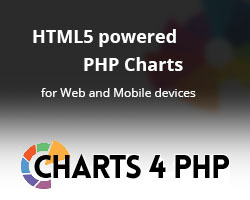 PHP Grid comes with free version and a licensed version. 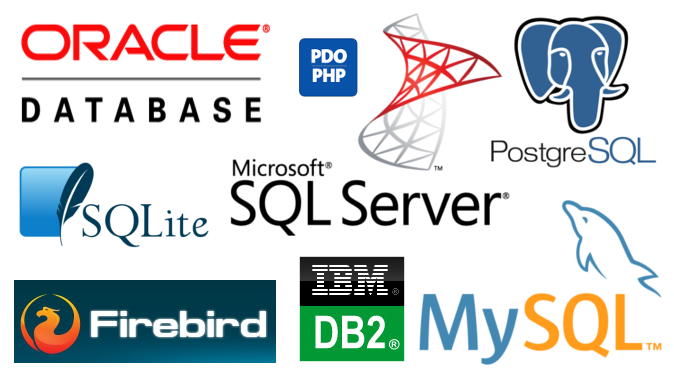 With Free version you can connect with others databases like MySQL, MS SQL Server, Oracle, PgSQL,DB2. 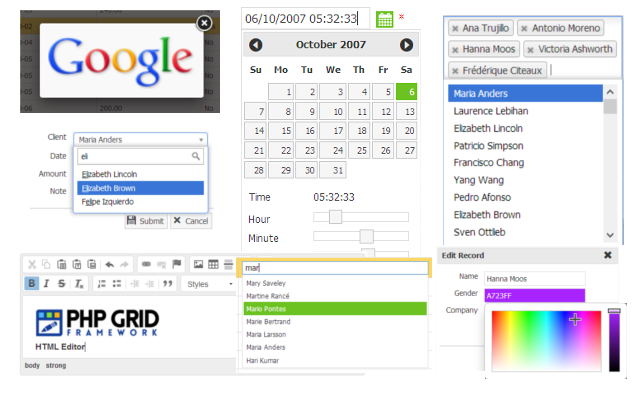 Licensed version also supports many advance features which you can integrate in your application. Complete code for this demo can be accessed from this link. You can download and start saving your time now! 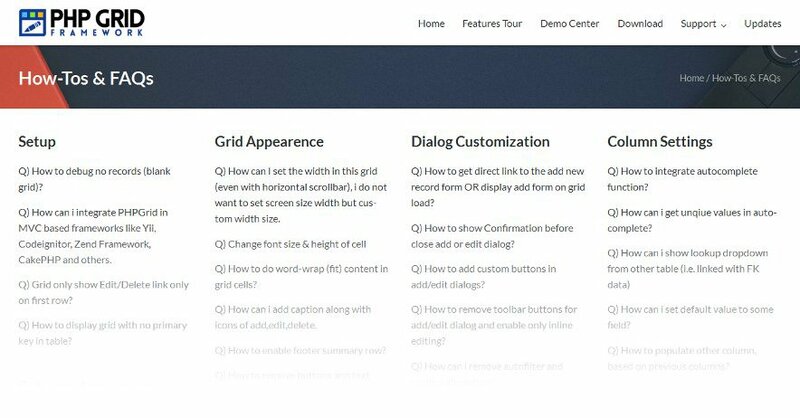 Today, we are glad to announce the release of PHP Grid v2.0. 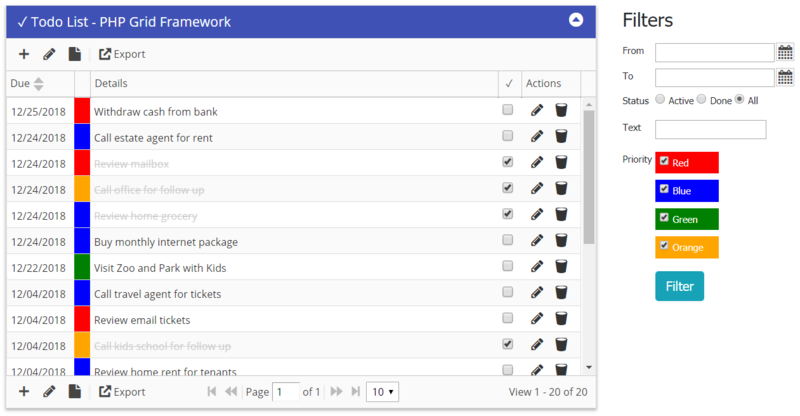 Adding a lot of features, updates, optimizations and fixes. Thanks for all who contributed in evaluation. Overall User Interface Enhancement, New Glyph Icons, Cozy Spacing Layout enabling it to be used on mobile devices easily. Bootstrap3 is also supported now. This version comes with 3 layouts, i.e. Cozy, Bootstrap and Classic (old slick version). New Professional Themes (Dark, Light, Colored). Metro Color Themes light/dark/black are recently added. You can also rollover your custom color theme using jQueryUI. Integration with jQuery Plugins. Now you can connect plugins like datetime, autocomplete, select2, fancybox, ckeditor, jscolor and many others with simple process, enabling endless possibilities in features. 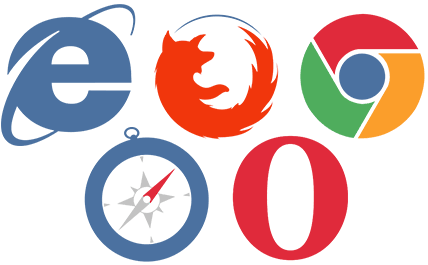 And finally, all such features gave same experience on modern browsers. Over 200+ fixes and updates. Active license customers can request free upgrade using this link. Get a complete Features Tour by vising our website. Logo, Faqs & Theme Redesigned! Logo is redesigned. Our new flat logo will now be used in support forum and checkout page. New responsive theme is rolled out for website. Howtos & Faqs page is redesigned for fast lookup of your query. We’ve tons of faqs so make sure you review them before waiting for answer. Support forum search is also there for help. What’s coming next … we’re working hard in rolling out new version of PHP Grid (v1.6) with lots of updates and new features, so stay tuned. I recently updated online documentation page to make it developer friendly, fast and each to navigate. The previous version was very unorganized, and honestly speaking, i usually didn’t use it for my development (instead i preferred Ctrl+F in markdown file — docs.txt). Now, in updated version on right side, there is a list of complete table of contents for easy access. It also contains a new ‘Using’ section that dictates the steps required to implement certain feature. The future updates are also planned to be in same format, and i believe it’s just what a developer like in documentation. Copy > Paste > F5! Also there is a FAQ article posted along articles section. More helping articles like tutorials, general integrations in frameworks are inshaAllah likely to be posted there in near future. Just in case, you need premium support and more quick response, try connection with gtalk on [email protected] for live chat.